Today was one of those days. One of those days where I rolled in and out of bed in a half-sleeping stupor, forcing myself up every nine minutes to tap the alarm clock yelping harshly on the dresser, for well over an hour. One of those days when, after waking, I couldn’t help but settle onto the couch with a tired pup snuggled into my cheek for another twenty minutes more before finally dragging myself into the shower. One of those days where, even having replaced my usual weekday-morning green tea with a more weekendly cup of coffee, I just couldn’t seem to clear the fog in my head and gain momentum into my busy day. It was one of those days where I found myself longing for comfort food. I wanted something warm and beefy, a stew perhaps, or maybe something with noodles or cream or cheese…. And then, someone was kind enough to retweet someone else‘s link to these quinoa-corn muffins. Many people serve cornbread with chili or barbecue, but when I was young, it somehow happened that we always had cornbread with beef stroganoff. Back then, of course, the cornbread came in those pressurized, cardboard cans that never failed to give me a partial heart attack each time I tore one open, and the stroganoff came in a box with egg noodles and a pouch of flavored powder–just add a pound of ground beef and you had dinner. I can only imagine how much gluten was packed into that meal…. Dietary restrictions aside, I’ve reached a place in my life where I prefer to use as many recognizable, pronounceable ingredients as possible. I find the process to be more engaging, the end result to be more rewarding and definitely more satisfying. 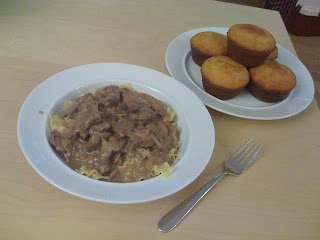 So tonight I would try my hand at a homemade beef stroganoff and freshly baked quinoa-corn muffins. This was my first experience using quinoa flour, and I’d read that it can have a very strong, bitter taste. I could smell the bitterness upon cutting the bag open and was immediately concerned for the muffins. They turned out beautifully, though, and the taste was unexpected and decidedly unique. I found it difficult to put words to at first, but I think that earthy is an appropriate description. It tasted like the woods, like a mouthful of bitter soil and sweet leaves from the deep wet that exists in the places where sunlight can’t reach. This is how I will think of quinoa flour from now on. The muffins were a pleasant new flavor experience with a crumbly, cornbread texture. And the stroganoff was rich, creamy, and, most importantly, comforting. Heat a large skillet over medium-high heat with a drizzle of olive oil. Season the beef with kosher salt and pepper and coat lightly with the rice flour (this is most easily done in a broad, shallow dish). Shake off any excess flour and brown the meat in the skillet. Do not cook the beef completely through, just allow to develop a crust, and remove from the pan. Reduce the heat to medium and coat the pan generously with olive oil. Saute the shallots for a few minutes until soft and translucent, and add the garlic. Once the garlic has become fragrant, about one minute, add the sliced mushrooms and saute until browned and tender. Season with salt and pepper. Turn the flame off. Add a glug of dry, white wine, return the heat to medium-high and deglaze the pan. Once the wine has reduced, add the meat back into the pan. Season everything with the fresh thyme, Worcestershire sauce, and a sprinkling of seasoned salt. Stir in about a cup of beef stock and allow to come to a boil. Reduce the heat and simmer for 20-30 minutes. The liquid will cook off, so continue to add stock as necessary. When finished, the sauce should be thick. While the beef and mushroom sauce is cooking, bring a large pot of water to a boil. And a handful of kosher salt and the pasta. Cook according to package instructions, drain, and return to the pot. Toss with a pat of butter. During the last 5 minutes before the pasta is done, stir the sour cream into the beef mixture. Season with salt and pepper to taste. Place some of the buttery noodles into a shallow bowl and top with the hearty stroganoff. Serve alongside a warm quinoa-corn muffin. I know that the last days of spring are quickly passing us by, and the hot days of summer will be upon us before we realize it, but there is still opportunity in the tired, rainy days that keep sneaking back in. Take advantage, indulge, and fill yourself with something warm and wonderful.